The room was fine, staff went out of their way to make sure I got 2 x queen beds and not queen plus singles. Room was very noisy though, from airconditioner units outside. Position was perfect for us, near Southern Cross Station, Southbank and South Wharf. We were so impressed we have booked again next February. Each year we have a sisters weekend (There's 6 of us), so it was perfect for us with three bedrooms and three bathrooms. Very comfortable and relaxing. Staff were very helpful and assisted us with any queries we had, especially when my husband was unwell. Many thanks to Gary especially! The staff when we checked in were amazing! They gave us maps and told us what festivities were going on in the city that weekend. They were helpful with connecting to the wifi and patient when we were running late with checking out due to one of my friends unable to find some of her belongings and then unable to close the suitcase! We were there four nights, took the breakfast deal. Good hot breakfast &buffet. Very nice staff. Central to everything, trams, trains, buses, restaurants. Has washer/dryer facilies too. Very good value for the money. Made our stay enjoyable. Highly recommend this place. Both my mother and I enjoyed our stay at the Alto. The unit was very clean and well presented. The staff were friendly and helpful. Also, we found the Alto�s close proximity to Southern Cross station and trams into the city fantastic. We really enjoyed our stay. The staff were very friendly & helpful, room was comfortable & clean. The relaxation room was a real bonus. Thankyou for making our stay in Melbourne more enjoyable. Very enjoyable stay, couldn't fault anything. Really enjoyed the breakfast! It was great. All of the staff were friendly and professional, from housekeeping to the breakfast personnel, to the extraordinary front desk/concierge personnel. Very helpful and all recommendations were right on! Great stay, thank you! Will use again and recommend. We have stayed at the Alto numerous times over the past few years. We have always enjoyed the stay hence we keep coming back. Again as with all previous stays we again enjoyed our brief stay and will definately keep coming back. The staff from reception to room staff are all friendly and helpful. Great place to stay. Being able to purchase myki tickets at the Alto was beneficial. We see the Alto as a home away from home, each time we come and stay just reinforces our opinion. Staff are always pleasant and helpful. The rooms are always clean and little bits in the kitchen always well stocked and appreciated. The beds are a dream, we were worn out from the traveling and to just crawl in and out like a light. Convenient location. Comfortable room . Look forward to staying again. Extremely pleasant surprise to find room ready on arrival at 12:30 and also to receive a free upgrade to a penthouse suite. Also love your green features like the natural skylight. 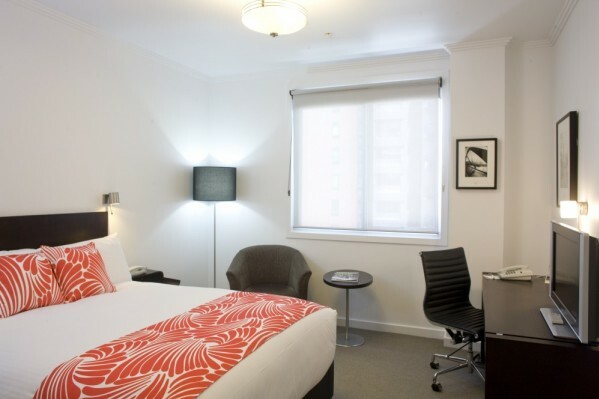 The Alto Hotel On Bourke was the perfect place to stay for a business traveler. It was quiet, clean, and convenient. The breakfast was very good. I loved the massage room and was thankful for the computer stations, since my laptop died. The front desk staff was courteous and helped me plan my day trips. I would recommend this hotel to anyone. Would describe 'Comfort' as 'excellent' if room did not overlook a lane which was noisy during the evenings. (The room was consequently gloomy, as well, but it would be churlish to criticize 'The Alto' for early 20th century planning.) Will happily stay again. While we do have windows that open for fresh air they will let in some city noises unless both sections of the double glazing are closed. Great stay. Do refer to my review at Tripadvisor.com by JusT76 after 48 hours once Tripadvisor folks publish my post. Thanks. Chinese New Year was celebrated on 9 & 10 February 2013. At 9pm hotel staff spoke to the families in the other apartments that had gathered for some shared time. From the moments we walk into Alto to the day we left we were Most Impressed by the friendly and most helpful staff, the high standard of fitting & furnishing, and with our lovely 3 bedroom apartment, Great location, Great Breakfast & Excellent Coffee machine we used during the day. We plan to stay here again. Just Loved it. Check in was friendly and pretty quick, the upgrade was very much appreciated. Rooms were nicely furnished and the supplied toiletries were very nice. I loved the framed artworks decorating the hotel. The room was pretty clean but attention to detail could have been a little better, eg the remote controls for the tv was extremely grotty. Overall though I was impressed with the location and hotel itself, and will definitely consider staying here when my husband and I next travel to Melbourne. I expected the room to be small but I was surprised how comfortable it was. outstanding, helpful staff. Comfortable, economical room. proximity to airport bus is good. internet connection good. not very proximal to free tourist transporation. A very pleasant place to visit and will come again when next in Melbourne. Have recommended the Alto to friends. The stay as marked was excellent and very convenient to transports, facilities and servives. A great experience. I always hate giving star ratings but I have stayed at the Alto before and returned this time because the staff are so friendly, the rooms are very clean and comfortable, and the location is perfect for trams, trains and walking. The bed was a little soft, and the petite queen room very small, but being a personal preference thing that's understandable. We had some trouble with the keycard door lock on checkin, but Russell was very patient, polite and helpful persevering and sorting it out for us. Our new Alto Indulgence beds feature a down pillow top. On request these can be removed however they will make the bed firmer. It was great. I will definitely be back next time I am in Melbourne. The location was great so close to Southern Cross Railway station and meant I could walk anywhere around the city. The room was very comfortable and the shower was great. I read the email I got last week saying you could buy tram passes from the hotel which is also great and hire bicylces. It was was perfect for me as a solo traveller.